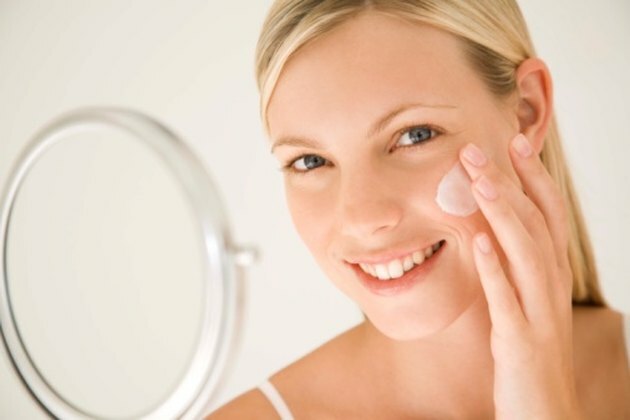 If you suffer from facial redness, you may use a moisturizer to calm the area and relieve your redness. Rosacea, keratosis and eczema are examples of skin conditions that can cause redness to appear on the skin. Moisturizers can be used to calm the skin and reduce the redness of the skin. The American Academy of Dermatology (AAD) website says that redness caused by rosacea can be reduced by using topical treatments with metronidazole. Besides metronidazole, Cetaphil Daily Facial Moisturizer includes the redness-fighting ingredients cyclomethicone and glycerin. It can be used on a daily basis and also contains a built-in SPF 15 sunscreen. This protects your skin against damage and redness caused by the sun. The moisturizer can be applied in the morning before you put on any makeup. Users from the Rosacea Group website gave Rosacea Care Moisturizer, a facial moisturizer, an average rating of five out of five stars. It is a mild product with active ingredients that include Vitamin K and willow herb. These ingredients calm the skin to reduce redness. L-Alpha Bisabolol is included in the moisturizer to give the moisturizer antibacterial properties to prevent future bouts of red and irritated skin. It is recommended by the manufacturer that you apply the cream each evening before bed. According to the Medical News Today website, Alan Fleischer, M.D., chair of the department of dermatology at the Wake Forest University School of Medicine, recommends the use of moisturizers with lactic acid like AmLactin. It is a moderate moisturizer that can help replenish dehydrated cream. It is high in antioxidants, which can help soothe red and irritated skin. It is particularly helpful for relieving redness caused by dryness and the skin condition keratosis. It is recommended for use in the evening, but it may be applied in the morning as well for individuals who have very irritated skin.